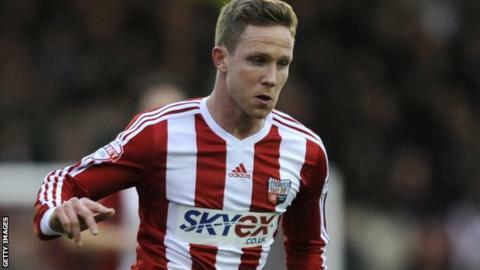 Brentford midfielder Adam Forshaw will miss the final two games of the season after having an operation on a longstanding ankle problem. The 22-year-old has scored eight goals in 40 appearances this season and was named League One Player of the Year. "It is aimed at addressing an ankle issue that has been troubling him many months," Brentford's head of medical Neil Grieg told the club website. "It arose from a trauma sustained during his teenage years with Everton." He added: "It has gradually developed and increasingly restricted him. "We have maintained a constant dialogue with the leading foot and ankle specialist in the country in order to ensure that we were able to manage Adam's condition, without compromising his long-term health. "The surgery was deemed a success. "Adam will now begin a graduated and carefully-devised rehabilitation programme over the summer break, with the aim of having him return to the squad during the pre-season period." Forshaw had a loan spell at Griffin Park in 2011-12 and joined Brentford from Everton at the end of that season. In total, he has scored a total of 11 goals in 100 appearances for the west London club.